More info:Prices based on 2 adults sharing. Mimimum age 14. 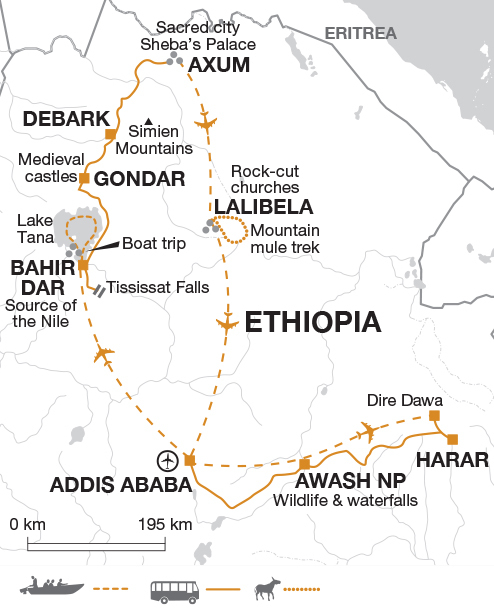 Ethiopia - with its fantastic churches, amazing scenery and wonderful people - has a rich cultural heritage, which we fully explore on this comprehensive tour. We travel in small groups ensuring that local suppliers are able to gain the maximum benefit from our visit. As well as viewing the magnificent sites, groups are encouraged to experience local life - such as eating in local (and excellent!) restaurants and passing time chatting in local markets. The very warmth of the Ethiopian people is for many a tour highlight. On many departures we use local leaders as part of our policy to employ local people wherever possible, however, some departures are led by UK based leaders who have worked in Ethiopia for many years and have formed strong relationships with local crew, suppliers and the people. Whether you travel with a local or UK based leader we can ensure an experience that allows plenty of opportunity for local interaction.